THE NEW ZEALAND HERALD captured the contrasting mood between two cities with poignancy, but almost accidentally. After three days of heavy black borders to mourn the loss of some 147 dead and a further 50 missing, the newspaper and other media across NZ told stories of courage, drama and devastation in the Christchurch earthquake. More than half the front broadsheet page of the Herald was devoted to the death of five-month-old Baxtor Gowland, a child of the last quake. Pictured clad in a scarlet Father Christmas outfit and cottonwool beard, Baxtor was born just two weeks after the 4 September 2010 quake. And now, tragically, he is a victim. In the minutes after Tuesday's devastating earthquake, the people of Santa Maria Ave, Redcliffs, gathered at the top of the street and hugged and cried. Still in shock from the violent shaking, they scrambled from their shattered homes and sought comfort from one another - many will never be able to live in their homes again. One side of the street has several homes cracked beyond repair. Others have been almost split in half and are now in danger of falling down on to a street below. Another story reported how an Australian female urologist used tradesman’s tools – a hacksaw and a multipurpose knife – to amputate both legs of a quake victim lying trapped under a beam in a collapsed building. She saved the 52-year-old’s life. In the aftermath of disaster, where to start? We start with each other. We take care of each other, we acknowledge this loss. On Pacific Scoop, former Fiji Times editor Jale Moala, now a subeditor with the Christchurch Press, described the city as being “like a war zone” and a shock to Fiji migrants just used to cyclones and hurricanes. Local Radio Apna and Suva’s Fijivillage.com were condemned by authorities for quoting an unnamed doctor saying eight Fiji Islanders had died in the earthquake. The authorities insisted this was false. Up to 15,000 men, women and children besieged Tripoli's international airport last night, shouting and screaming for seats on the few airliners still prepared to fly to Muammar Gaddafi's rump state, paying Libyan police bribe after bribe to reach the ticket desks in a rain-soaked mob of hungry, desperate families. Many were trampled as Libyan security men savagely beat those who pushed their way to the front. Among them were Gaddafi's fellow Arabs, thousands of them Egyptians, some of whom had been living at the airport for two days without food or sanitation. The place stank of faeces and urine and fear. Yet a 45-minute visit into the city for a new airline ticket to another destination is the only chance to see Gaddafi's capital if you are a "dog" of the international press. There was little sign of opposition to the Great Leader. Squads of young men with Kalashnikov rifles stood on the side roads next to barricades of upturned chairs and wooden doors. But these were pro-Gaddafi vigilantes – a faint echo of the armed Egyptian "neighbourhood guard" I saw in Cairo a month ago – and had pinned photographs of their leader's infamous Green Book to their checkpoint signs. There is little food in Tripoli, and over the city there fell a blanket of drab, sullen rain. It guttered onto an empty Green Square and down the Italianate streets of the old capital of Tripolitania. But there were no tanks, no armoured personnel carriers, no soldiers, not a fighter plane in the air; just a few police and elderly men and women walking the pavements – a numbed populace. Sadly for the West and for the people of the free city of Benghazi, Libya's capital appeared as quiet as any dictator would wish. Turkey is mounting the biggest evacuation operation in its history, with more than 25,000 Turks living in Libya fleeing. Twenty one other governments have asked Ankara for help getting their nationals out. A US-chartered 600-passenger ferry is leaving Tripoli for Malta and Israel has allowed 300 Palestinians from Libya to enter the occupied territories. 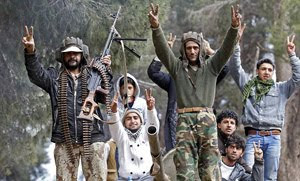 Petrol and food prices have trebled; towns outside Tripoli have been ripped apart by bitter fighting between Gaddafi supporters and opposition groups. Loyalist forces patrol the capital’s streets, tanks guard the outskirts and the state radio station is heavily guarded. This war zone is rapidly exploding.